Design is recognized as playing a crucial role not just in improving the patient experience, but also as an aid to healing—and healthcare art is no exception. Appropriately selected healthcare artwork can help ease anxiety, create an experience of shared community, establish landmarks and support wayfinding, encourage mobility, reinforce branding, and much more. As art becomes more central to the healing experience, it’s important to get designers and artists involved early in renovations and new construction projects to create works that meet facilities’ varied needs. The article also challenged the idea that hospital art should be figurative, finding that abstract art often proved a more welcome distraction to viewers. On the other hand, ample evidence indicates that exposure to the outdoors creates a healthier environment for patients, and many hospitals and physician offices aim to replicate that with nature-inspired art and photography. That was the thought behind the recently added art installation in the progressive care unit at Haywood Regional Medical Center in Haywood County, North Carolina. Local artist Elizabeth Garlington helped lead an effort to add photography rich with outdoor images from the western part of the state. The artwork focuses on local scenes as a way of triggering memories and encouraging engagement between patients and providers so that nursing staff and physicians can get patients to better open up about how they’re feeling. This installation’s color scheme was planned to soothe anxious patients, but it turns out the photography also serves as a motivational tool. One of Haywood’s physical therapist assistants reported that patients were pushing themselves to walk further because they wanted to see the pictures. Increasingly, however, art is selected that offers a strong sense of place and creates a connection between the healthcare environment and the broader community. The Exuberance sculpture for the new lobby of the Kentucky Children’s Hospital within UK HealthCare’s Chandler Hospital is one case in point. Photo courtesy of UK Healthcare. Strecker worked with John Medwedeff on a public art piece commissioned by UK HealthCare that could “provide a healing environment enhanced by artistic expressions.” The pair’s creation—a group of massive, colorful kites that soar below the lobby’s skylights—are intended to be a playful and child-friendly focal point and to create an uplifting and comforting environment. The seven aluminum kites are made of plastic tubes filled with colorful marbles, which form a tribute to children’s play but also create a powerful connection with visitors. That’s because out of the 56,000 colorful marbles that fill the kites, 26,000 were donated—forming a sense of shared community. The product creates a connection to healthcare spaces that are seen as important parts of the community. But it also highlights the importance of bringing art consultants into the design process early. Exuberance’s artists had to work with the hospital’s construction team to find the best places to weld structural supports into the lobby’s steel infrastructure. “When installing art, many pieces need specific structural substrates that need to be considered right from the beginning,” Hovi points out. There are other factors to consider early, including lighting designed to enhance the experience of viewing the art. “Determining the right place for artwork means designing all the equipment to allow for the artwork to be viewed for greatest impact,” Hovi says. Hovi says her firm is seeing more interest in interactive and multidimensional art that is engaging and fun for patients. 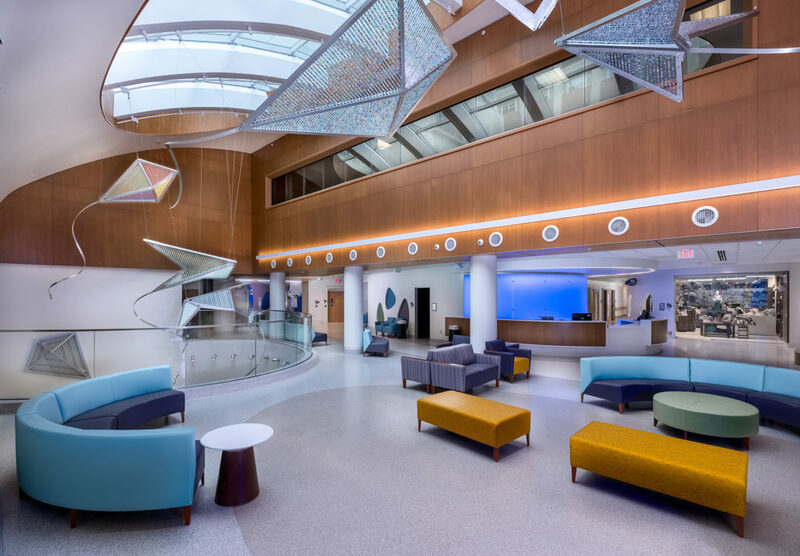 When Hassenfeld Children’s Hospital, part of NYU Langone Health’s new Helen L. and Martin S. Kimmel Pavilion inpatient facility, opened June 24, it included New York–inspired artwork as a nod to the children it would welcome. A replica Statue of Liberty made entirely of LEGO® bricks and a nearly three-story sculpture of a Dalmatian balancing a taxicab on its nose are meant to provide a fun, welcoming distraction.